Labels are standard hazmat identifiers, designed to meet certain specifications, and placed on packages, packagings, or overpacks. Placards are standard hazmat identifiers, designed to meet certain specifications, and placed on outer containers, trucks, cylinders, or other vehicles used for transport. Markings are additional identifiers (other than hazard labels & placards) that further describe the package. Labels, placards, and markings are indispensable compliance products. Adhering to stringent regulatory standards, Labelmaster offers a multitude of options designed to help you comply with hazmat regulations. At Labelmaster, we respond to the ever-changing demands of the hazmat industry. Choosing the correct labels and placards is vital for the safe handling and shipping of hazardous materials. The hazmat labels, placards, and markings infographic can help your company. Click the image to enlarge the hazmat infographic. Infographic copyright of Labelmaster. Get the hazmat poster with one of Labelmaster's regulation combos. Hazard Class Labels are standard hazmat identifiers, designed to meet regulations. Each label has markings that tell what type of hazard is identified on the label. They help identify what type of hazardous material is in a package. These hazmat labels and handling labels are placed on hazardous material packaging such as UN certified packaging, or overpacks. Shippers are responsible for choosing the correct labels for their shipments. Labeling a material incorrectly can result in costly shipping delays, fines, and injuries. If you're not sure which hazard class label fits your needs, use Labelmaster's Label FinderSM. They communicate universally - labels relate information about the hazards of a chemical inside a package internationally, regardless of language. This helps determine what type of hazard is identified on the label. They offer special handling instructions - labels clarify handling requirements for a package, making shipping and handling dangerous goods a safer process. They help employers communicate hazards - employers use hazard labels to alert employees of potential hazards of materials. They help carriers decide where to place packages - hazmat labels help carriers determine stowage and segregation onboard planes, trucks and vessels. They inform emergency responders - emergency responders use hazard labels for accident clean-up and potential evacuations. Being complaint with the hazmat regulations means using the right label every time. Labelmaster knows what hazmat compliance is. What do hazmat labels look like? It depends on the hazard - there are 9 different classes of hazardous materials. The labels for each class are a different color. To learn more, read our complete breakdown of hazard class markings. These labels must be a specific size, shape and color. They stand out - labels must have contrasting background and a dotted line border should be used if the label is not distinguishable from the package. The symbols and text on the labels must be either black or white. Where are hazmat labels placed? On Hazmat Packaging & Overpacks - hazmat labels are affixed to packaging offered for transport. They must be printed on or permanently attached to one side of the packaging. Labeling should be on the outside of overpacks unless it is visible through the overpack. Near the UN Number - the hazmat label should be attached as close to the proper shipping name and UN number as possible. They should never fold around the corner. If that happens they can be attached using a tag. Internationally - for international shipments of hazardous materials, the hazard class number must be displayed in the bottom corner of both primary and subsidiary labels. In the US - since October 1, 2005, the U.S. has required a hazard class number displayed in the bottom corner of a subsidiary risk label. Maintaining compliance with Dangerous Goods regulations doesn't stop with packaging and labeling. Shippers need to be aware of placarding requirements before putting their shipments into commerce. This hazmat placard infographic provides a brief overview of the regulations governing the use of DG placards on trucks and trains. 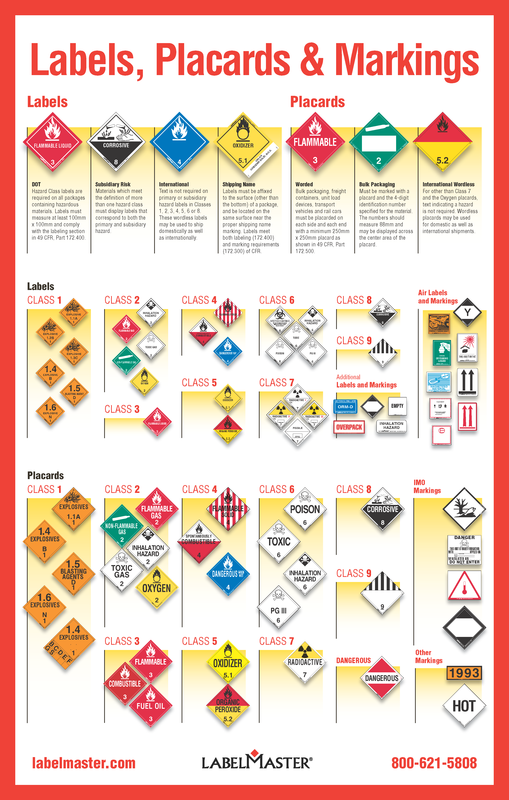 DOT Placards are larger, more durable versions of hazard labels that are usually placed on bulk packages or transport vehicles to communicate the hazards of chemicals inside. This is why placards are used. If you need assistance determining which DOT placard fits your needs, use Labelmaster's Placard FinderSM. Why are DOT placards important? They inform the public - dangerous goods are regulated in transportation because they pose an increased safety risk to property and the public. Placards warn the people of the presence of hazards while they're driving or near large quantities of hazmat being transported. They inform emergency responders - if shipping papers aren't available at the scene of an accident, a placard may be the only way responders know what materials are involved in the accident. They are required - within the United States, certain quantities of hazardous materials within a transport vehicle or bulk packaging must be placarded, although there are several cases where placarding exceptions come into play. If you want to ship hazmat, you are responsible for providing the carrier with the appropriate placards unless they already have the correct placards on the vehicle or freight container. Otherwise, the motor or rail carrier cannot transport the shipment of hazardous materials. What do DOT placards look like? Larger, durable labels - placards look a lot like labels, but they are larger and more durable. They meet design and durability regulations - placards must be printed in the square-on-point configuration measuring 250 mm on all sides and include a solid inner border that is approximately 12.7 mm from the edge of the placard. The hazard class number in the bottom corner of the placard must measure at least 41 mm. They are legible - text used on a hazard placard must be in English unless otherwise required by a competent authority. Any text, borders, symbols, and hazard classes may be either black or white. Where are DOT placards placed? On transport vehicles or bulk packages - rather than being placed on a smaller individual package, placards are used for larger amounts of hazardous materials being transported. Often they are placed on the exterior of transport vehicles. They must be on all 4 sides - placards need to be displayed on all four sides of a transport vehicle or bulk packaging. They must always be displayed in the square-on-point configuration and be located at least 3 inches away from any other marking that may reduce its effectiveness. This is what a compliant placard vehicle is. See More Placard Markings, Regulated Marking Labels, Air Label Markings, and Shipping and Handling Markings. Markings are additional identifiers that further describe a package. They are added in addition to hazmat labels and placards. They are essential for complying with 49 CFR regulations and staying safe while transporting dangerous goods. Why are hazmat markings important? They identify materials and specify handling - markings provide information to supplement hazard or handling labels. Carriers and consignees refer to markings when accepting hazardous materials to ensure proper handling of the material as well as regulatory compliance. They help you comply with hazmat transport regulation - incorrectly identifying a hazard is a serious infraction. The Department of transportation and 49 CFR take marking rules seriously. Many penalties and fines are imposed each year for marking violations. They inform emergency responders - just like labels and placards, marking provided additional information on what materials are involved and what safety precautions need to be taken. Most responders use markings to reference an emergency response guidebook for further information. What do hazmat markings look like? They use proper shipping names - markings identify a material or hazard using proper shipping names, UN numbers, or other descriptors required in the regulations. No specific size, shape or color - unlike labels and placards, markings are not specific to a certain style. However, they must have a sharply contrasting background and they may not be covered by labels or anything else that would reduce their effectiveness. Where are hazmat markings placed? It varies depending on the hazardous material and transportation type - there are various types of markings used for different forms of hazardous material transport. Labelmaster has gathered a full breakdown on marking guidelines and UN markings.